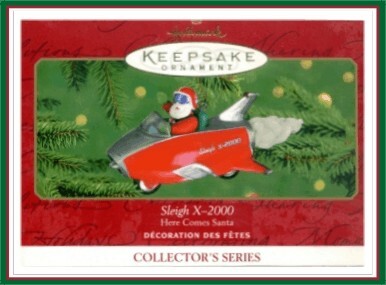 Sleigh X-2000 is number 22 in the Here Comes Santa Series - Handcrafted - Dated 2000 - Sculpted by Nello Williams - QX6824. that travels to the stars! The three wheels turn on Santa's space-mobile. MIB with normal box aging (slight box corner bump). Has Price Tag. Has never been displayed.